A mid-week stay in Stirling presented the golden opportunity to revisit some of my favourite trails from my uni days. As fate played out, Pete an old classmate from uni has recently set out on an adventure in the form Flying Fox Bikes, in the small town of Alva nestled on the edge of the Ochil hills only a short distance from Stirling. I visited the impressively stocked shop for the first time since its inauguration. The last time I visited, I had witnessed the final touches being administered for the grand opening. 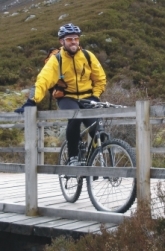 Pete aka Pedro informed me that he would be leading a group of local mountain bikers around the trails behind the uni and up the back of Bridge of Allan after work and I would be most welcome to join them. I accepted without hesitation, since my memory was a little hazy regarding the trail networks I had last ridden nearly a decade ago and this would be a great opportunity to take the guess work out of navigation. A 7 o’clock start led from the university grounds up into Hermitage Woods, a magical little woods clinging to the hillside overlooking the campus. From there it was on up into Pendreich Woods overhanging Bridge of Allan, where more fast, fun, flowing single track awaited us and awakened fond memories of former bike trips from days gone by. As light began to fade, the challenge level increased, especially at speed. Deer were a plenty, with regular sightings along the trail, but thankfully none decided to jump out into our pathway. The following morning I decided to cycle up Dumyat for old times’ sake, one of the Ochil hills overlooking the Forth valley and the Firth of Forth. Standing at 417m, it gives a climb just short of 400m total. As I ascended I spotted a couple of mountain bikers up ahead and set out to chase them down. As I finally summited Dumyat, it turned out to be none other than the main man at Flying Fox Bikes, Pedro himself on his titanium On One hardtail with a friend out for a morning spin. We descended together back to Hermitage Woods and went our separate ways, as I had plans to ride in Glentress later that afternoon. After lunch it was back on the road and a short drive down to Peebles and the 7Stanes Glentress trail centre. Never one to do anything by half measures, I naturally went for the 30km black graded trail which included 80% on single track. A small section of the trail was closed due to the large number of fallen trees blocking the trail and thus resulted in a slightly shorter distance of 27km covered in just over 2 hours. Snow drifts remained from the harsh winter and still lay deep between kilometres 14-15 along the ‘Boundary Trail’ section and together with more fallen trees, made riding a distinct challenge of a more unusual nature. With over 800m of vertical ascent over the full distance, there is no other way to describe it, but as an epic ride. 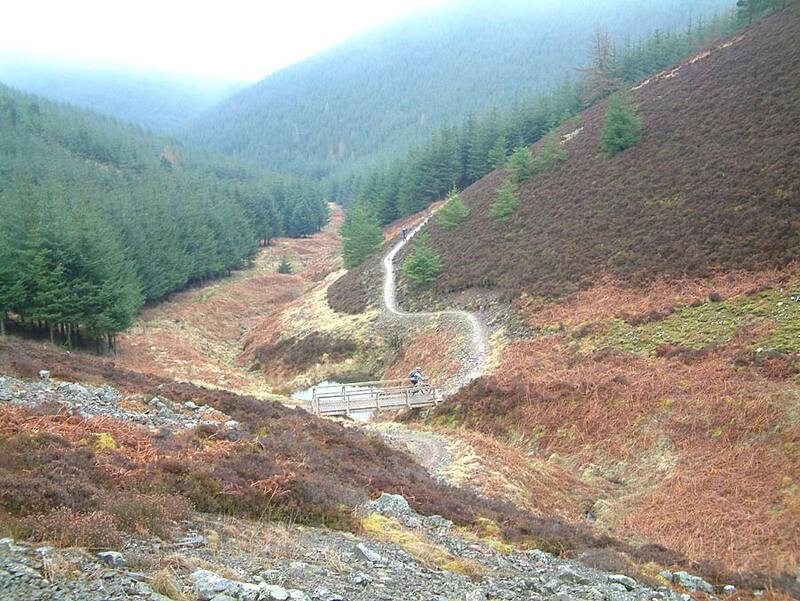 I can categorically state that Glentress is without a doubt my favourite 7Stanes trail centre of the lot! Following lugging a trailer around the Blanchland wilderness on the weekend, I reverted back to the simple formula of merely two wheels to conquer two more of the legendary 7Stanes mountain bike trail centres, notably Newcastleton and Innerleithen. Newcastleton lies just north shy of the English border in the Scottish Boarders. The red route provides a comparatively easy and gentle 16km loop, comprising 60% single track and taking just under an hour to complete. If one is looking for a fairly relaxed ride, that still provides a real mountain bike experience, then this is the trail centre to visit. 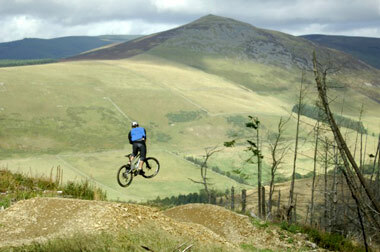 Next stop was Innerleithen a short drive north to what many consider to be the heartland of Scottish mountain biking. What awaited me has to be experienced to be fully appreciated. The red graded XC course (with black graded options) measures 19km including 75% of single track and took 1h15mins to complete. Right from the car park just off the bank of the river Tweed, the track starts to wind its way up the steep mountainside. It seemed like a never-ending climb, which lasts for 8km, bar a short 3/4km section of descending after 2.5km, providing only brief respite. The climb was a stark reminder to me of why I gave up the pain and hardship of XC racing in favour of pure downhill many years ago and the remainder of the course only confirmed my sensibly good choice. Thankfully what goes up must come down and so you guessed it, 11km of downhill, with minor undulations, awaits the patient peddler. It is on the back-end of this formidable XC course where the fun and real challenges begin. A black graded option presents itself in the form of ‘Razor Rock’ and demands a high level of technical ability and poise to master. This is only where it starts to get interesting. The final 2km are shared with the ‘Make or Brake’ downhill course and so it is natural to expect some seriously aggressive downhill features, including rock drops, bomb holes, step downs and table tops, requiring absolute concentration and confident bike handling skills. The exhilaration and pure rush of adrenaline you experience lets you forget the pain you suffered all the way up the seemingly never-ending climb at the beginning. Was the climb worth it? To that, I simply suggest you head down to Innerleithen and saddle up to experience this world-class XC course for yourself! Friday past, the time finally arrived, when I had a chance to face my mountain biking nemesis and go for a third time lucky, filing previous mishaps away for good in the bad memories cabinet. I refer to Dalbeattie, Scotland. Click here for previous Dalbeattie episode. I arrived fresh off the ferry to be greeted by the beautiful Scottish sun, as it shone unperturbed by the masses of Icelandic volcanic ash in the skies. A short drive brought me to the trail head of Dalbeattie. Out came the bike, my combat gear was thrown on and off I went. The trail brought me back to the Qualifier, a very steep and technical rocky drop, which leads on to the infamous Slab. I easily nailed the Qualifier, but when I got to the Slab, I began to have second thoughts. I began to wonder what had possessed me to attempt this in the rain in the first place. I sat at the top for quite a while psyching myself up for the plunge. Eventually I relented after a thorough risk analyses weighing up the pros and cons. I felt I could live with myself not riding it and leave it for another day, especially since I didn’t want to jeopardise being able to race the next Red Bull Road Rage event in Belgium, just five weeks away, as well as potentially not being able to do my scheduled SMBLA Expedition module course on the following two days. So it was down the short cut to the right of the Slab, which in itself is still very steep, with plenty of gnarly rocks scattered the whole way down and also graded black like the Qualifier and the Slab. The Terrible Twins, another black graded couple of consecutive rock face drops were a little further on and demanded both skill and concentration. The rest of the 25km passed without incident and I was content with the first 1.5 hours of riding back in Scotland. I will say I found this trail to be one of the most demanding of the 7Stanes I have ridden, with a lot of the red course verging strongly on black grade and generally being quite a punishing course, for both bike and rider. I hopped back in the car for a short trip up the road to tackle the next trail by name of Mabie. The red loop, at 18km with 65% single track, is a pure fun trail. If you are looking for a ‘flowy’ trail then maybe Mabie may be the one for you. This was a nice change after Dalbeattie. Not too technical, but with a few challenges thrown in to keep your attention, this is a 1 hour blast that leaves you with a smile once you roll back into the trail head. The highlight has to be at the top of the first climb, a panoramic view over the Solway Firth right across to England and the hills of Cumbria over the sea divide to the south. Trajectoires Cycles Nantes, France have agreed a sponsorship deal with the undeniably quick Irishman Janos Köhler. The deal is initially for the duration of the 2010 Red Bull Road Rage downhill road racing season which kicks off in Belgium this coming May. Trajectoires Cycles were eager to have Köhler on board after he turned heads by beating the likes of Cédric Gracia and Frédéric Moncassin as a newcomer to the international downhill road scene in 2009. Trajectoires Cycles shop in Nantes are France’s leading fixed wheel and single-speed retailer and are also stocked with the latest high end mountain and road bikes. As part of the deal with Köhler they will be providing all on-site parts, mechanical assistance, and local transport requirements at the Red Bull Road Rage races. You are currently browsing the Janos Köhler's Blog blog archives for April, 2010.